Why buy expensive costumes when you can pull these ones off for cheap? Don't worry if you haven't got a costume yet, Halloween is all about improvising. College is stressful enough without having to spend $200 on a super impressive Halloween costume that you’ll only wear once. With a small budget and a few ingredients you can throw these costumes together while binge-watching TV in your room. Throw on your favorite black outfit, then make these wings by deconstructing an old umbrella. Just be careful not to poke any inebriated ghosts or vampires in the eyes later on that night. If you’re looking to truly freak your friends out, create some eerily realistic wounds on your face and body. If you’re a modern art lover who has a makeup bag the size of a small country, this look is for you. 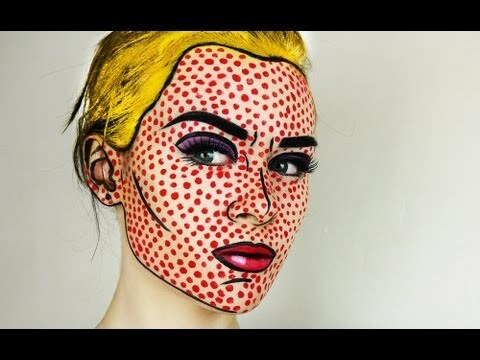 Use liquid eyeliner to create black lines and red body paint to add all-over dots. Use purple eyeshadow, fake eyelashes, and red lipstick to make the whole thing really pop (pun intended). 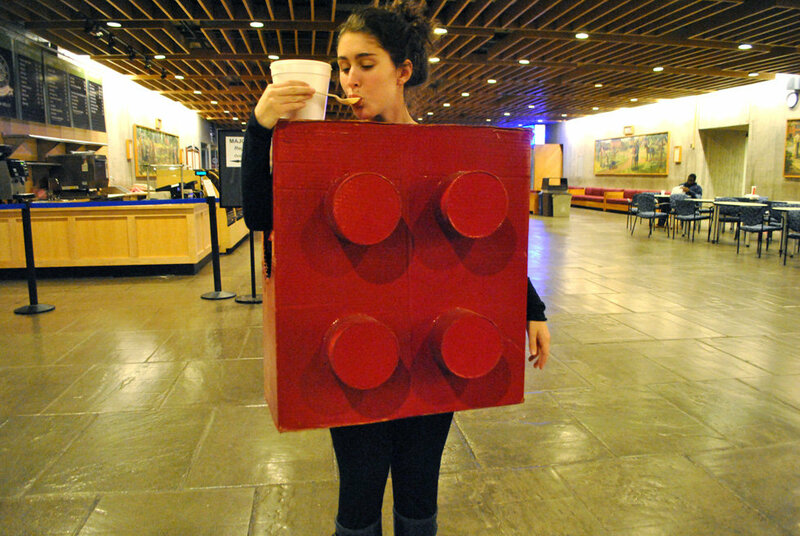 You can make this costume using things you would totally have in your kitchen if you didn’t live in the dorm, so you may need to hit the supermarket. Materials include items like toilet paper, cold coffee, flour and corn syrup. The whole process involves some day-before prep, but we think the effort is worth it for the uber cool end result. We never thought we’d write this sentence, but you can make this costume using trash from last night’s party: solo cups and a cardboard box. Simply cut holes into the box, paint it blue or red, and glue matching solo cups onto the front and back surfaces. You’re so college right now, sister. If you’re looking to truly freak your friends out, create some eerily realistic wounds on your face and body. 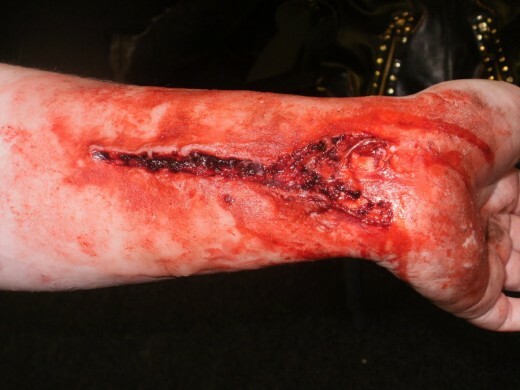 Just mix Elmer’s glue, food coloring, and cocoa powder to make fake blood; then use tissue to add raised wounds on whichever patches of skin you choose. Fair warning: this isn’t the sexiest look, so maybe plan on going home solo. If you’re looking for cute and easy, why not safety pin some purple balloons to a matching shirt and call it a day? Extra points if your party drink of choice is red wine. This costume is perfect for groups. Simply duct-tape groups of four boxes in formations that will fit into one another, paint each set a different color, and then cut holes for heads and feet. Oh, and know that you won’t be accepting hugs (or any other type of close bodily contact) while in costume. You can easily make a variety of animal costumes by using a hoodie as your base. Simply make eyes, ears, and teeth out of felt, and then attach them to the sweatshirt using fabri-tac glue. 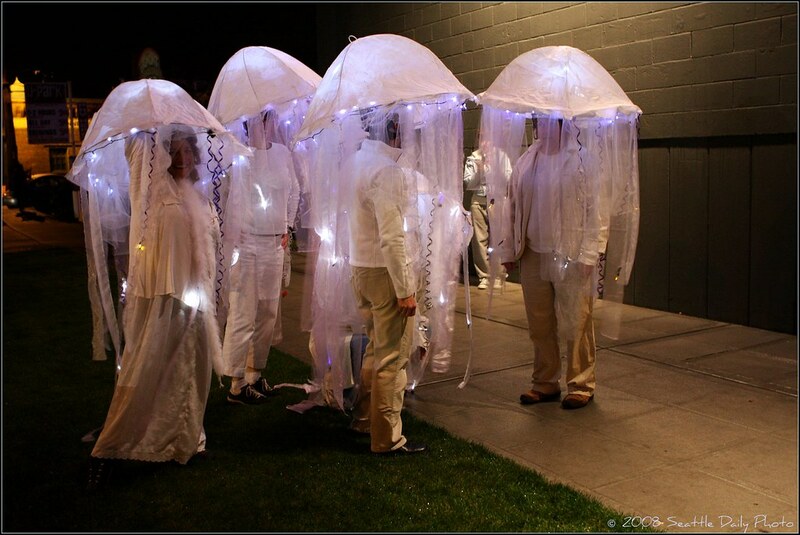 To achieve this elegant look, paint an umbrella white (or use a white umbrella) and then attach bubble wrap to create the illusion of tentacles. The only downside we can think of is that you won’t be able to double-fist your drink of choice.